The Hat Lady | Alzheimer's disease and a women who has not forgotten how to love. Alzheimer's disease and a women who has not forgotten how to love. I found two cats today. They live on the grounds of the nursing home. I sat on a bench and tried to pet them, but they were too timid. They stayed twenty feet away and cautiously watched me. My first instinct was to care for them – to hold them and let them know they are loved. But then I realized they are already being cared for. A small shelter built from wood sits on the cemented floor of a covered picnic grove, making them double protected from the rain. There are also two bowls filled with food and water next to their home. I was relieved knowing they are being taken care of. I thought of mom inside her room as she lay in bed. These are her last days here on earth. Her body is shutting down. My family and I sit with her as much as possible, letting her know she is not alone. I hold her hand and watch her. She no longer smiles. She looks frail and tired. It’s heartbreaking to watch. I was not expecting this intensity of emotions. I cry. Then I cry some more. What will I do without her? She has been my constant for over 45 years. How does one go on? I don’t know the answers. But I do know one thing. I am grateful. Grateful to God for giving me a mother-daughter relationship – one that has formed and shaped me into the person I am today. The Alzheimer’s disease has been hard on all of us. When she was first diagnosed, I feared for what lay ahead. I thought there would only be hard days ahead. And there were. But, surprisingly, there were good days. In fact, there were more good than bad. Mom never gave in to the disease. In fact, she only became better. Her smile was contagious and offered comfort to everyone. We learned to take one day at a time, to laugh and love even harder than before. As she lay in bed slowly slipping away, she reaches for our hands – not only in comfort for herself but for us. She is always taking care of us. Even at the end. I think of the cats outside basking in the warm, morning sun. They, too, are being cared for. I don’t need to worry about them. And I don’t need to worry about mom. God has been taking care of her all along. In fact He has been taking care of all of us this whole time. The Alzheimer’s has not won. Mom’s knowledge for her family and friends is deeply rooted within her. She knows us. She loves us. She has never forgotten that. A woman sits in a chair watching children play. They are laughing as they search through an old wooden chest for treasures, occasionally looking at her to wave. They are her grandchildren, but she does not remember this. She knows they are a part of her life but cannot connect the significance of their relation. To her they are small and beautiful children having a good time. She enjoys watching them. The tallest girl reaches into the wooden chest and pulls out a white brimmed hat with a wrinkled and dusty bow hanging off the back. The woman smiles and shakes her head up and down. The hat is familiar to her. It fills her with warmth, love and happiness. The girl puts it on her head and twirls around for everyone to see. The woman laughs. The hat reminds her of… what? She sees four girls playing in a long ago place. A time much different from now. They play games on a freshly cut lawn while a man and woman watch from their lawn chairs. Could it be the same hat she wore when she herself was a young girl? No, there is more to it than that. She sees a man holding out his hand to a woman. She takes it, and he leads her close to him. They start to dance – a dance that has lasted over forty years. Is it the hat she put on that long ago day when she married the love of her life? No. This hat represents much more. Babies. She can smell the scents of baby powder and spilt milk. She sees a young woman carrying a child while three little ones are fast asleep on her bed. Maybe it’s the hat she put on the day her first child was born. The one she wore while raising four children. No. There is still something more. She sees young man wearing a tuxedo. He waits and watches as a beautifully dressed woman in white walks towards him. Maybe it’s the hat she wore the day she became a mother-in-law. No she senses there is more. She sees the worry in a man’s face while he kneels down and prays for his son who has just gone off to war. Maybe it was the hat she wore while praying for her son’s safety. She smells babies again. This time, she hears them cry. The love she feels is the kind of love only a grandparent can have. Yes, that’s it. It’s the hat she put on the day she became a grandmother. The tall girl takes the hat off and puts it back in the chest. She reaches in a pulls out another one. This one is a darker color and not as pretty. The children examine it then put it back. A grown woman in her forties bends down to give the woman a kiss. She helps the woman out of the chair and walks her to the bedroom. Who is this grown woman? Is this her daughter? Alone in her bed, she hears the grown woman talking to the children still playing and laughing. She also hears her husband walking up the steps to their room. Then she remembers. For a brief moment she remembers all of the hats she had worn in her lifetime. The ones that gave her love and joy. She was blessed and would do it all over again if she could. Then she remembers the hat the children did not want to play with. It was different. It was restrictive and did not fit right. 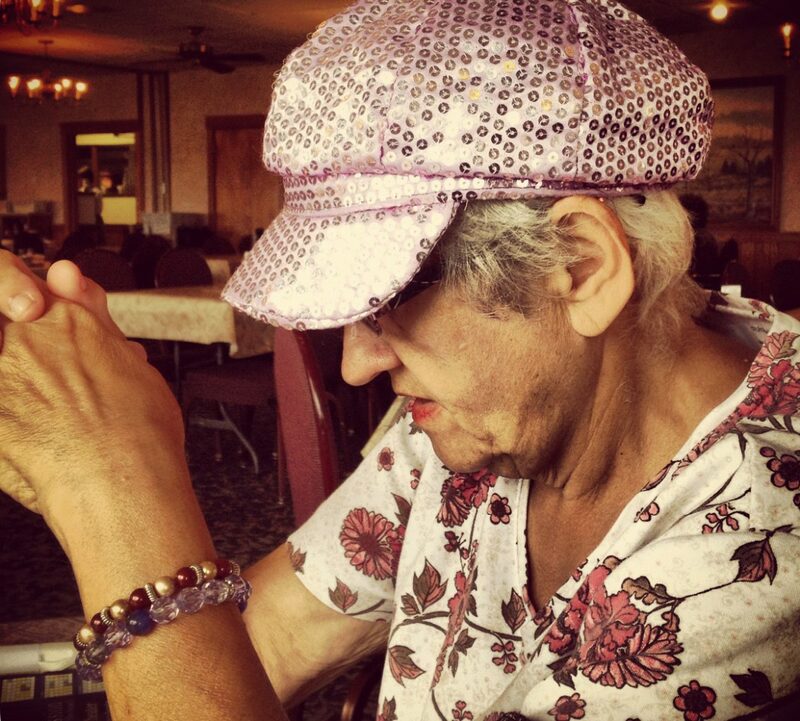 This hat, the Alzheimer’s, is slowly taking her memories from her. She can see them fading away. Yes, this is the hat she must wear now. But she is strong. She knows this. For as long as she is alive, she will continue to make memories. Not for her but for her loved ones. When I was a girl in the eighties, mom had a favorite radio station. We called it the oldies station because all of the music was from the 1950s and 1960s. I called them old because they were released way before my time. If a song is released before you were born, you can consider it old right? The car radio was always tuned into this station, and it never left. On rare occasions, if a friend was in the car with us, I was allowed to change the station. But mostly music from Elvis, The Beach Boys, and The Beetles could be heard flowing from the speakers. Mom still loves hearing those old songs, and if you sing with her, she will dance for you. I once picked mom up from the nursing home on an unusually warm day. It was the middle of winter, but the sun was shining and the birds were singing. It was a nice reprieve from the cold temperatures that kept us indoors. I chose to play one of her favorite songs from her younger days. You know the ones I call oldies. As we drove, the spring-like air blew through our hair and mom’s head danced to the music. I wondered if the music took her back in time to when she was a young woman. Was she in a car with friends? Was the wind blowing through their hair as they drove down the highway? Was the radio cranked up with one of the top ten songs of the day? I started to wonder what life was like for mom when she was a young woman. Did she wear the latest fashions? Did she date anyone or was my dad the only one who had her attention? Was she a planner or more of a carefree, take life as it comes kind of gal? And did she really surf in the ocean like she claimed? I can easily get these answers from relatives. But what I really want is to hear it from her. I used to call her all the time. I’d ask her about a recipe she had given me or how to get a stain out of a shirt. I’s also ask for advice or to tell her a story from my day. We can no longer have heart to heart conversations, but there are still things I want to know. This is where you come in, family and friends. Comment below a memory of mom. It can be from many years ago or last week. Don’t worry about mom and me. We may no longer have heart-to-heart conversations but we do communicate. As they say “actions speak louder than words.” And using our motions and expressions to speak has brought us closer together than ever. Don’t forget to share a memory of mom. Oh, and can anyone tell me… Did she really surf in the ocean when she was a teenager? My sister and mom sat side-by-side on the bed flipping through a photo album. It was a collaborative gift to mom from my aunt and myself. We both contributed photos of loved ones in the hopes that she would enjoy it. They started with an image of children neatly arranged in three rows. The older and taller ones stood in back and the younger ones sat in the front. Their faces were all smiles as they stared at the camera and waited for the flash to go off. The photo beside it was another picture of children, but not the same ones. This one was taken years later. The children, offspring of the ones in the first photo, were not posed in an orderly fashion. Instead they were making funny faces as the lens on the digital camera focused before freezing their faces in time. Other pictures included family vacations, holidays, picnics and even school pictures. All depicting a lifetime of memories. Mom smiled and lovingly placed a finger on each picture before moving on to the next. I like to believe that she knew who the people in each one. She may not remember names but knows the important part they play in her life. And I think I’m right. When they reached the middle of the album, mom stopped and stared a two pictures. No longer smiling, tears ran down her face. The images were both from her wedding day almost fifty years ago. The first was mom in her wedding dress ready to walk down the aisle. On either side of her stood my grandparents. The other was a picture of mom and dad right after the ceremony. They stood in front of the altar, smiling in anticipation of their future life together. I almost didn’t include these two pictures in the album. I wasn’t sure how mom would react when she saw them. It is common for Alzheimer’s patients to recall long-term memories more than events from the recent past. I know this to be true for mom. But would the feelings of seeing her parents and a younger version of herself and dad be too much for her? I opted to include them, and her tears were heartbreaking for both myself and my sister. She looked at those two pictures for a long time as tears continued to fall down her face. Eventually, she turned the page and continued. There is a saying I’ve often heard. I don’t know who originally said it, but it makes sense. Life is all in how you look at it. I have a choice. I can look at the disease that is slowly taking mom away from me and be angry. Or I can look at it from a different perspective. I choose to look for the seemingly small – yet big – miracles that sustain mom and me as we travel this road. Mom’s tears were a gift to both of us. For me, they confirmed that somewhere in the depths of her mind, she remembers. And for a few moments, mom took a trip down memory lane to a wonderful time in her life. And that’s all that matters to me. Mom is a social butterfly. It’s an amazing gift for a woman who can no longer speak. And it always amazes me. At the beginning of this year, mom and dad moved to a new town. A few weeks later, due to unforeseen circumstances, mom moved into the nursing home. It took some time, but she has adjusted to her new surroundings. She has a daily routine with familiar faces to give her comfort. This comfort allows her to socialize, and as she does, she leaves a lasting impact. If the nursing home were to elect a mayor, mom would be the winner. Everyone loves her. All day, she walks the halls giving hugs and kisses to her fellow residents and caretakers. When visiting mom, I am greeted by residents who exclaim how wonderful she is. Her nurses always tell me stories of how mom made someone laugh or how she comforted those who are hurting. A few weeks ago, a new resident had moved into the nursing home. This beautiful woman’s family was having a hard time leaving their loved one. When mom saw them grieving, she walked over and hugged each one of them. Mom had no idea why they were crying, but her act of kindness soothed their broken hearts, allowing them some peace with their situation. When they returned the next day, they thanked mom. I don’t know if mom remembered them, but am sure she smiled before walking away. Mom is also known outside of the nursing home. At a restaurant, a woman approached our table and called mom by name. Mom smiled as if she had always known this person. After a few minutes of conversation – well one-sided conversation – mom’s friend bid us goodbye and left. I have no idea who she was or how mom knows her. But this is how mom works. From the depths of her disease she reaches out to others. She makes them smile when they need it the most. And they remember her. And they love her. If you were to meet mom today, she would greet you a great big smile and a kiss. She would make you feel loved. And you would love her too. I sat beside my dad as he lay in a hospital bed in the critical care unit. I rested my head on the bed’s railing and held his hand in mine. Dad’s age has not stopped him from living an independent life while being the primary care giver to mom. I always knew that if something were to happen to dad, there would be tough decisions to be made about mom. She needs 24-hour care which myself and my siblings cannot provide. The day dad went to the hospital, I did the hardest and toughest thing I’ve ever had to do. I moved mom to a nursing home. For now, this is a temporary move. If dad recovers, he will continue to care for her. If not – well, I’m not ready to go there yet. This heart-breaking choice haunts me. Mom, who has become the child in our relationship, now sleeps in an unfamiliar place surrounded by strangers. I asked her for forgiveness, but she did not understand my plea. I don’t know what tomorrow will bring or if dad will recover. This dark valley I currently walk is filled with anxiety, stress and sadness. It is a place I walk knowing that life can change forever in the next moment. If I were not in my shoes – if I were merely watching someone else’s life – I would feel sorry for them. I might even wonder where God is during all of this. But I am not observing it. I am living it. And God is here with me. Mom can no longer verbally communicate. The disease has taken that away from her. But God speaks through her. I see Him when her eyes light up at the sight of my dad and when she tenderly holds his hand in hers. I see Him when dad tells me how much he loves me and when he makes me laugh even though he is in pain. I see Him when mom reaches out her hand and puts it in mine. I see Him when my husband manages our home in my absence. I see Him in friends who reach out to make sure I am ok. I see Him in my aunts who are acting in mom’s place to make sure I get enough rest. And I see him in my siblings as we encourage and comfort each other. With every step I take on this journey, God is constantly reminding me of his presence. He is holding me up and giving me the strength to walk. And the best part is, He will never leave me. I took a shirt from the hanger, held it up then threw it on a pile in the corner of the room. I went to the next shirt and did the same thing. I repeated this task until I finished inspecting all the clothes hanging in the closet. As I did this, mom stood behind me watching as I decided the fate of her clothes. Mom can no longer wear clothes with buttons or zippers. When dad asked me to go through her clothes, I was not prepared for the wave of emotions that rushed over me. My heart cried for mom – the woman who was always there for me when I needed her and showed me how to love the Lord. It’s been several years since I cleaned out mom’s closet. As the disease progresses, our roles have reversed. I am now the caregiver and she is the child. This past Saturday we celebrated mom’s 69th birthday. I picked her up early from the nursing home. The nurses know I arrive every Saturday morning and are kind enough to have her dressed and ready. They wished mom a happy birthday, making her smile. At home with dad and my sister, we let her open gifts. Dad bought her a dress, my sister gave her a hat and I made her bracelets. She changed into her new dress, and with her hat and bracelets, danced to Elvis tunes with dad. We had an early dinner and afterwards, things calmed down. We were watching television when dad noticed mom was not in the room with us. I went into their room to find she had climbed onto her side of the bed and fell asleep. I covered her with a blanket and closed the door. I guess all the dancing made her tired. When she woke up, we had cake and ice cream. Mom loves her sweets and ate all that was on her plate. Afterwards, we went outside to visit with other residents. Even though mom cannot talk, she loves socializing with them. She will shake their hands with a big smile. They all love her. Our celebration for mom was small. It was just the four of us, but I will always remember it. For a few hours, we relaxed and enjoyed our time together. And nothing else mattered.